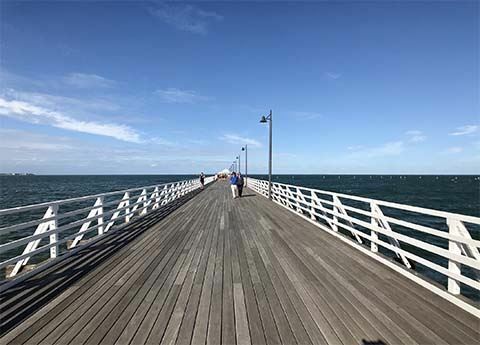 Join us for a gentle walk exploring the Shorcliffe Pier and local walking tracks through Lower Moora Park after lunch. The first pier, 350m long and erected in 1882, was called the Sandgate pier. Near the shore line, one each side of the pier, were separate swimming pools for ladies and gentlemen. By 1939 it was possible to swim from Woody Point to Shorncliffe protected in a crate. The current pier, the Shorncliffe Pier, was opened in 2016 just in time for the start of the Brisbane to Gladstone Yacht Race. CARE: be SunSmart, wear walking shoes, bring a water bottle and your camera. BRING: a cup/glass, plate and cutlery. Lunch will be provided at the meeting place shelter shed.